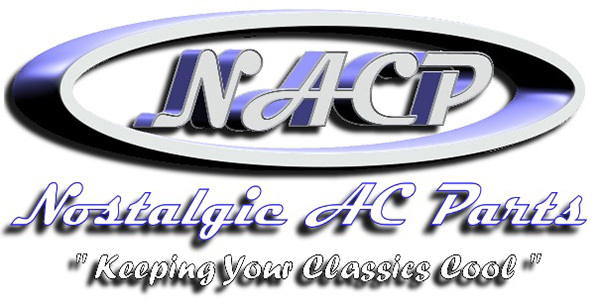 Nostalgic AC Parts specializes in a/c kits for all vintage/classic vehicles. All the systems we sell are designed and manufactured by us in Ocala Florida. We offer two types of kits for classic cars; the first type is a direct fit system that will bolt into the vehicle without any modifications. The second type is a universal fit system that can be adapted to almost any vehicle without any major modifications. The direct fit kits we offer at this time are kits we have designed in house with the customer in mind. Since we are a manufacturer we are always ready to design new kits for vehicles. If you would like information about designing a system for a particular application, please feel free to call us. We have manufactured many different setups for customers including big truck and agriculture applications. Our a/c kits are the simplest kits to install and do not require the car to be altered in any way. If we do not have a direct fit kit listed, it is because we have not had the opportunity to fit that particular vehicle or we have decided against designing a specific kit due to the limited demand. Our universal kits work great in any old classic, except for six volt systems. We do not carry any six volt a/c systems. If you have a vehicle that you would like to install a universal system into we have already laid out the basic kits.